The primary focus of this blog, and the website it's attached to, is environmentalism and the performing arts. That has largely excluded painting because a painting isn't a performance: you don't watch it unfold. Or didn't. But David Hockney's been playing around with his iPad and has discovered it can replay every mark he makes. This blog has just started subscribing to Daily Climate Links, a daily email from Skeptical Science, John Cook's invaluable blog that gets skeptical (OK, I'll spell it with a 'k') with climate skeptics. “The process is a simple one. Carbon dioxide in the atmosphere has the effect of a pane of glass in a greenhouse". You've described yourself as a "cheerleader for science". Does it need cheerleading? The story of the drug cartels in Mexico is too complex for mainstream journalism. The story of the Tea Party works fine. "What little we know cannot be explained in print media’s standard 800 words or less (or broadcast’s two minutes or under). And the story, like the murders, is endlessly repetitive and confusing ... The absence of understanding of these surface narratives is what keeps the story static, and readers feeling impotent." "When attention is scarce and there are many choices, media costs something other than money. It costs interesting. If you are angry or remarkable or an outlier, you're interesting, and your idea can spread ... Thus, as media moves from TV-driven to attention-driven, we're going to see more outliers, more renegades and more angry people driving agendas and getting elected." I love a bicycle and I haven't been without at least one since I was three years old ... The bicycle might just be the greatest of all inventions. "Planetarians", "decarbonists", "sustainablists", "transitionalists", "green patriots" ... David Roberts at Grist wants a new name to describe a significant group of people who support clean energy and action on climate change, but don't want to be called environmentalists. there are plenty of people who understand climate change and support clean energy but do not share the rest of the ideological and sociocultural commitments that define environmentalism as historically understood in the U.S. He's come up with another term: "climate hawks". The British Museum's director, Neil MacGregor (left), ends his History of the World with a solar-powered lantern. "solar energy is a dream of the future that echoes the oldest and most universal of human myths, that of the life-giving sun. You could see our solar-powered lamp as an echo of this myth - the heroic fire-stealing Prometheus reduced to the humble role of home help." The 96th object in A History of the World in a 100 Objects was a Russian Revolutionary plate. The 97th object was a David Hockney print showing two men in bed. The 98th object was the Throne of Weapons made out of guns. The 99th object was a credit card. Tomorrow at 9.45am, and then again at 7.45pm, the British Museum's director Neil MacGregor will discuss the 100th object, the solar-powered lantern, and the future of renewable, non-polluting energy that has the potential to liberate the developing world. Here we have the complex paradox which lies at the heart of the Cape Farewell project; we cannot look on melting glaciers as the Lakeland poets looked on the Lakes. Last week Neil MacGregor, director of the British Museum, chose the solar-powered lamp, as the 100th Object in A History of The World in 100 Objects. In choosing the solar lamp, he explained, he was also reflecting the metaphorical power of light. Water covers 70% of the Earth's surface. 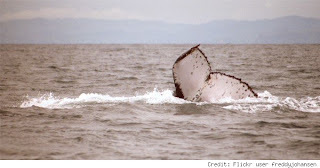 Since it's Blog Action Day - and the topic is water - co-editor Kellie Gutman gives a shout-out to the whale that has probably seen the most of it. Thanks to a photo posted on flickr, scientists were able to identify a female humpbacked whale, pictured in a photo off the coast of Madagascar, as the same whale seen in breeding grounds off Brazil. 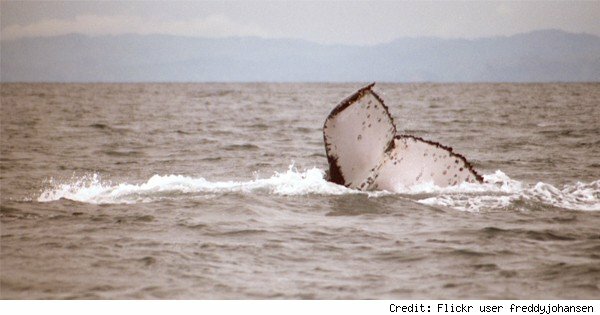 The migration of 6,100 miles is almost twice the distance humpbacked whales normally migrate. It's thought the whale may have simply lost her way. is "junk" a celebration or a critique of waste? In this guest post, Ashden Directory co-editor, Wallace Heim, questions the way "junk" is employed in the performing arts. ‘Junkitecture’ is a clever term, combining design and ‘waste’. But what if the materials used for buildings, for sets, for props, for puppets, for the vehicles and floats of parades, were thought of simply as ‘materials’? Of course, they would have a special value or feel if they had been used for something else. But to call them ‘junk’ is to share the attitude that separates the 'new' from what we think of as 'waste'. What is happening with the use of materials in the arts that have a history can often be more of a valorisation of consumerism and excess, a celebration of trash as ‘trash’ or salvage, than a critique of waste or an affirmation of recycling. What if no special claims could be made for using reclaimed or recycled materials because it was commonplace? Then, what would be remarked on would be the design, the space or object itself, and the qualities that the materials brought to it. WWF and others say "culture" has "central importance"
This blog follows on from yesterday's one not bothering to argue with people who don't want to agree with you, better to get on with doing something you like. Mark Twain understood this kind of persuasion when Tom Sawyer got Huck Finn to help him paint the fence. 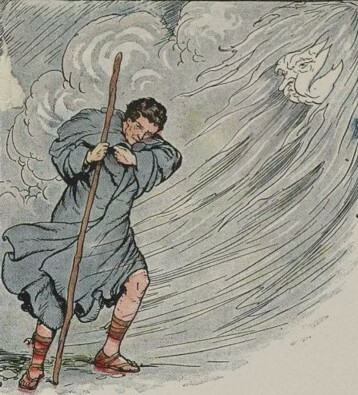 Aesop also understood it (see pic) with the fable of the wind and the sun, where the heat of the sun succeeds where the force of the wind fails. In his Guardian column yesterday George Monbiot praises Tom Crompton's Common Cause (pdf) as 'the most interesting report I have read this year'. The report shows (he says) that progressives have been suckers for a myth of human cognition that Crompton "labels the enlightenment model". Psychological experiments have shown that humans don't behave entirely rationally, they behave in relation to extrinsic or intrinsic values. We hang onto stuff that confirms who we are. We frame discussions in terms of values. And that - of course - is cultural. to explore the central importance of cultural values in underpinning concern about the issues upon which we each work. When it comes to popular culture and climate change, it emerged clearly from today's debate in Cornwall, the key idea is to break the subject of climate change down into its constituent elements. Otherwise it's too big, too divisive, and doesn't give people any sense of personal agency. This closely echoed Mike Hulme's point last year that climate change was a Rubik cube that needed to be disassembled. Too much had become caught up in it. The contributors at the discussion were Tim Smit, founder of the Eden Project, the comedian Marcus Brigstocke, Joe Smith, senior lecturer in Geography at the OU, and Vicky Long, arts producer, and formerly project director at Cape Farewell. The discussion was chaired by Quentin Cooper, presenter of Radio 4’s Material World. The best way forward was to get stuck into projects you believe in, make them work, and lead by example. Tim Smit gave the example of Rebecca Hoskings and the successful campaign to ban plastic bags in Modbury, South Devon. 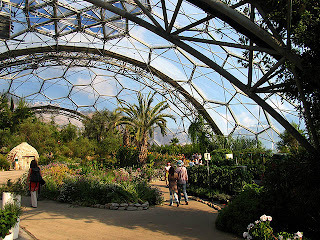 The discussion was recorded, appropriately enough, in a biomeme at the Eden Project. This blogger won't (unfortunately) be blogging about the 350.orgers at the 10:10:10 day at the Arcola as he's travelling to Cornwall for the second of four conversations on Mediating Change. It takes place tomorrow at the Eden Project. The contributors this time are Tim Smit, founder of the Eden Project, the comedian Marcus Brigstocke, Joe Smith, senior lecturer in Geography at the OU, and Vicky Long, arts producer, and formerly project director at Cape Farewell. The discussion is chaired by Quentin Cooper, presenter of Radio 4’s Material World. at popular culture and mass media in relation to climate change, and consider the origin of this engagement, the outcomes, and the all-too-frequent absence of concern. I' the middle of its tender blue". See our 'flowers on stage' series: flowers on stage: the poppy, flowers on stage: the daffodil, flowers on stage: the lotus, flowers on stage: the lungwort; flowers on stage: ‘breath of life’, flowers on stage: kudzu and flowers on stage: snake's head fritillaries Follow-up comment: flowers and the curve of the eye See also: Mabey says "I'm a great believer in play"
Behind the scenes look at the construction of Oikos, Britain's "first recycled theatre", a 120-seat work of 'junkitecture' in south London. TippingPoint has just announced 'Round Two' of its commissions for new works related to climate change. This year it is offering up to seven commissions, including one commission for outdoor work, a co-commission between TippingPoint and Without Walls. Deadline for applications is 6 December 2010. Tipping Pointers told where to see a four degree world - "Pakistan." Is climate change a zombie concept? The National Science Foundation has awarded a $700,000 grant to the Civilians, a New York theater company, to finance the production of a show about climate change. The Great Immensity, with a book by Steven Cosson (“This Beautiful City”) and music and lyrics by Michael Friedman (“Bloody Bloody Andrew Jackson”), tells the story of Polly, a photojournalist who disappears while working in the rain forests of Panama. to help drive forward transformative responses to resource scarcity and climate change from individuals and organisations working in the arts. It is intended as another point of connection in the growing network of support designed to help the UK’s cultural and creative sector. Sustainable Ability has just launched a report by Hilary Jennings and Lucy Neal on the cultural sector's response to climate change, along with a Google map of activities, the findings of a survey, and a useful list of additional resources. can you leave the water in the rivers? an altogether different understanding of what constitutes happiness and fulfillment. To gain this philosophical space, it is necessary to concede some physical space for the survival of those who may look like the keepers of our past, but who may really be the guides to our future. To do this, we have to ask our rulers: Can you leave the water in the rivers? The trees in the forest? Can you leave the bauxite in the mountain? If they say cannot, then perhaps they should stop preaching morality to the victims of their wars.